Get your seat belt with anchor pretensioner repair and save hundreds compared to buying a replacement seat belt assembly. 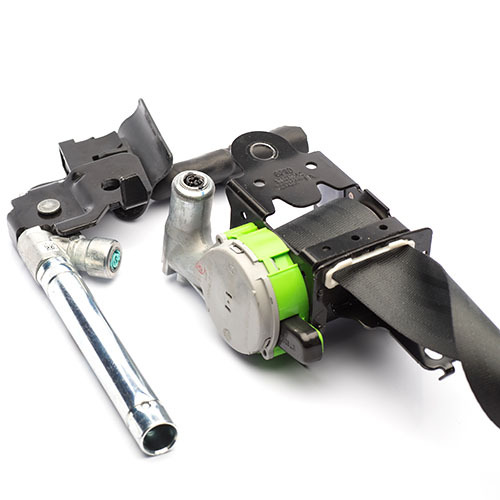 Seat belts with an anchor pretensioner on the bottom mounted to the car have a dual-stage seat belt assembly that requires repair after accident, crash or collision. Safety Restore is the leader in seat belt repairs, working on all makes & models from all years foreign and domestic. All you have to do is remove your seat belt with anchor pretensioner and mail it in for repair! 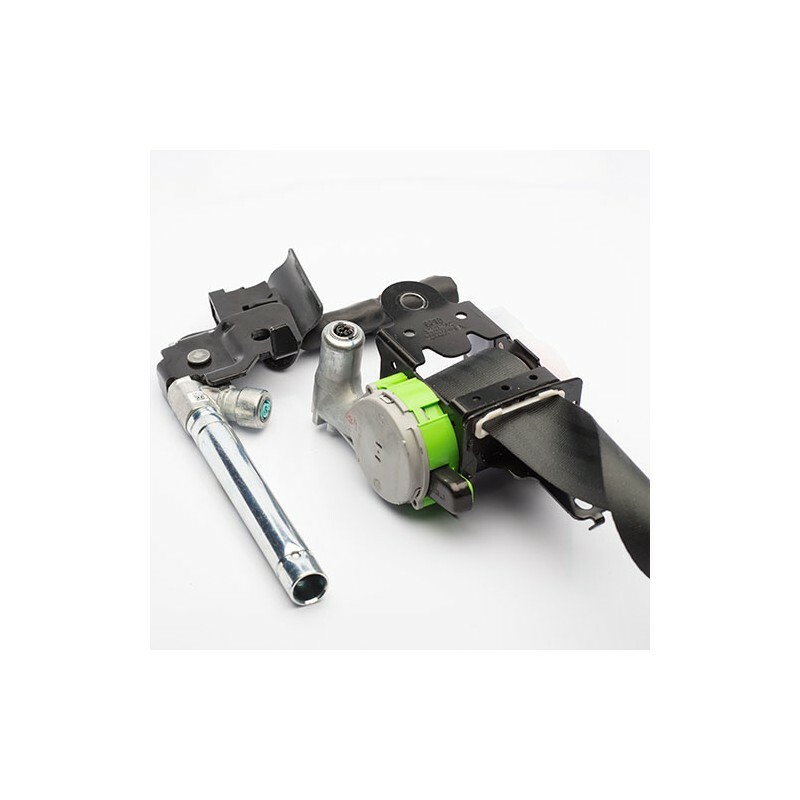 All seat belt retractors are rebuilt to factory condition and anchor pretensioners repaired after deployment. If your airbag light is on indicating a pretensioner code, it will be reset with this repair service. If your vehicle has been in a crash or you bought the car at a salvage auction such as Copart.com or IAAI.com you can save hundreds or thousands by having your seat belt anchor pretensioners repaired instead of buying replacement seat belts at the dealer or junk yards. Safety Restore offers seat belt repair services in the U.S. & Canada nationwide. 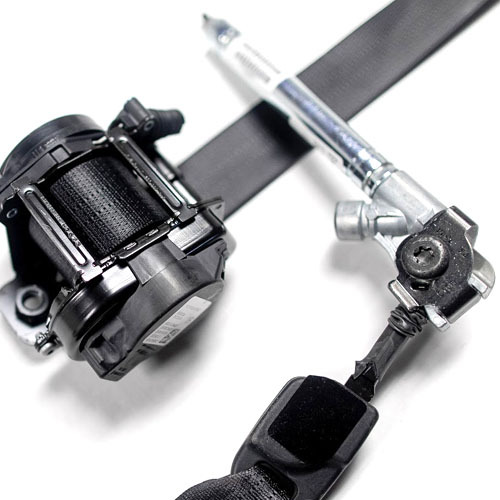 As pictured, this seat belt retractor has an anchor pretensioner to the left of it. It is mounted on the bottom of a car and also deploys during an accident. Both the seat belt and the anchor pretensioner is equipped with a gas charge explosive that goes off during an accident. Once deployed, the seat belt will no longer work. In addition, the airbag light will go off and seat belt related codes will be stored. Seat belts are perhaps the most important safety devices in any car. They save lives! Apart from locking on sudden stops, they are engineered to deploy during a crash. With a deployment mechanism similar to airbags, seat belts and anchor pretensioners go off in a crash. he gas charge responsible for deployment will be activated and can no longer work. So if your car is after accident or you are rebuilding it because it's salvage, a seat belt repair is a must. 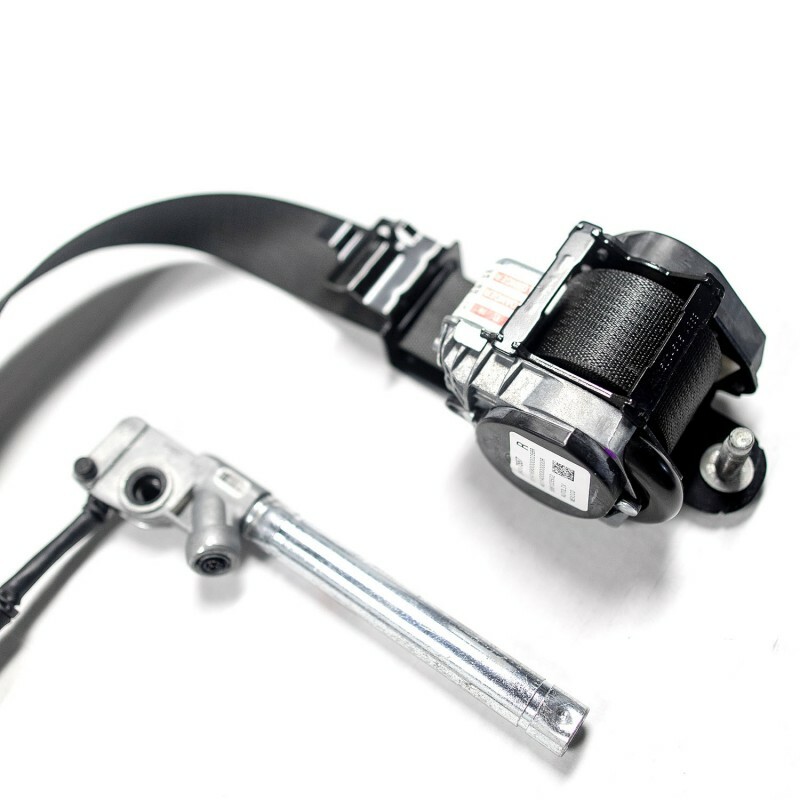 Our certified and experienced technicians will rebuild your locked, blown and deployed seat belts using OEM parts and to the manufacturer specifications. This will assure a safe driving experience for both the driver and the passengers. Trust Safety Restore as your source for all seat belt repairs in all makes & models. The crash is detected by an impact or crash sensor. The signal is transmitted to the SRS airbag computer. The SRS airbag computer activates the seat belts and/or airbags for deployment. The SRS airbag module stores crash data such as speed, impact details and occupant data. The pyrotechnic device inside the seat belt retractors tightens the seat belt to keep the occupant in place and away from the airbag. The anchor pretensioner acts as a secondary deployment and helps tighten any remainder slack from the opposing side. When you are buckled in with a seat belt and a rollover occurs, you will be held in place by a discharged seat belt. This deployment happens rapidly and is activated by an explosive as fast as an airbag. If in addition to your seat belts, the airbags deployed and your airbag light is on, you will need our SRS Airbag module Reset service. A service to remove or clear all crash data and hard codes after accident. As with other repair services, you will need to remove your SRS airbag computer and mail it in for a reset. This service is compatible with all makes & models! Your airbag light will be reset and your SRS airbag computer will be reprogrammed to factory condition. In addition to seat belt repairs, we offer seat belt webbing replacement on seat belts that are frayed, dog chewed, ripped, cut, torn, worn out or are simply old. Using OEM-quality webbing material, we can color match your existing seat belt color or you can choose to go with a custom color seat belt webbing replacement. Just like the seat belt repair service, you would have to remove your seat belt in need of webbing replacement and mail it in for service. If your dog chewed your seat belts, this service is what you need. Also very popular among classic restorations as well as older cars that require some love.